Ever since Al Gore introduced his famous slideshow to the world and stood up as a leader in the fight against climate change, advocates of the vegetarian scene have urged the former Vice President to acknowledge the link between eating less meat and helping the environment. Yesterday, Gore finally jumped on board saying that reducing meat in one’s diet is “the responsible thing to do” when it comes to the fight on climate change. So, what do you think? Gore has reduced his consumption of meat — but is not planning on becoming a vegetarian. He also now publicly links factory farming as a contributor to climate change — and encourages people to reduce the meat in their diets. A good start? Or still falling far short of what you expect? I just came across this post and even though I know it to be more than 2 years old, I would still like to have a say. Al Gore is doing great work – he acknowledges that this industry is a problem. This is a start. We all have to start somewhere. We can’t change the world overnight. But we can change what we do, and be open to explaining our choices to those who ask us. It isn’t fair to push our beliefs down someone elses throat. Even if we did, we probably will be ignored. But we can start with ourselves. Don’t come down on this man for not ticking every box. He is taking a positive stand, and he is listening and exploring ideas. He is only human. And he is doing a fine job at it. Maybe we should take a step back from pointing the finger and look at our own mirror reflection and understand the contribution that we make to our planet and our fellow human beings. Thats a good start. At least then we can say that we took action based on our own ethics and that’s better than never having any to start with. Well I don’t know about America but in Australia a person can drive for many hundreds of kilometers through land cleared for cattle grazing. The number of acres deforested for cattle and sheep rearing must be simply staggering,. The number of fish left in the ocean is drastically diminishing. I live on the coast and there used to be lots of professional fisherman, but no more. Yesterday I read on a website that you cannot be a meat eating environmentalist. And that giving up meat is the simplest, cheapest and most effective way everyone can do to help the environment. As much as I like Al Gore, I too think that looking at the statistics- David Attenborough too gave some scary figures – Al Gore really does need to link going veg with helping the planet and educate people about the connection. even though it is an “inconvenient diet “” We have been brought up to believe that meat is essential and brought up to believe that eating meat is manly. – a hallmark of masculinity. We need to make this simple change!! AL Gore was born into an Angus cattle ranch family that included growing tobacco. When Al Gore’s sister died of cancer after a heavy smoking habit, Gore’s father stopped growing tobacco. 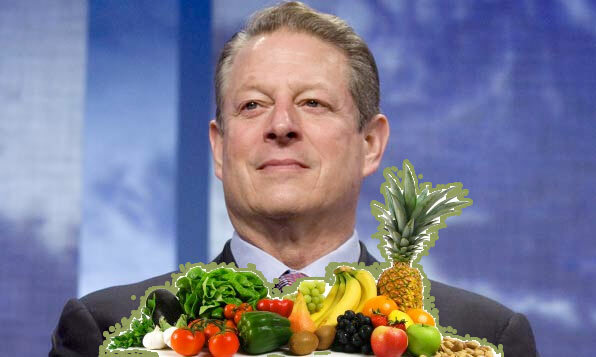 Al Gore got the smoking-cancer connection but seems innately unable to bring himself to provide anything except pale platitudes about a vegan dietary choice as being at the top of human behavioral changes required to slow climate change. Though there is much to do, it all has to be done simultaneously. That requires we examine the entirety of our human ecology—all of the behaviors that create the relationships between us and our external environment. Many high-profile people have proclaimed their veganism without making excuses. Given what’s at stake and his mission, Al Gore is inexcusably omitting veganism. You don’t have to attack him personally or ignore the good that he has done, but as he ignores the vegan response, he proactively leads people to ignore it as well. That is inexcusable and is having consequences for all life on Earth. Failure to achieve a vegan human ecology will not only continue the loss of biodiversity and destruction of ecosystems, it, by itself as a single agent, is undoing all the work on other approaches. We have to do it all. The sooner his “students” get a mind of their own and professionally challenge Mr. Gore on the issue, the extent of the terrible consequences now underway will lessen and we’ll be a species worthy of Earth’s miracle.